(WINDSOR, ON) – Looking to build on their recent win over the visiting Cape Breton Highlanders last week, the Windsor Express readied themselves to meet the league leading London Lightning Sunday afternoon. 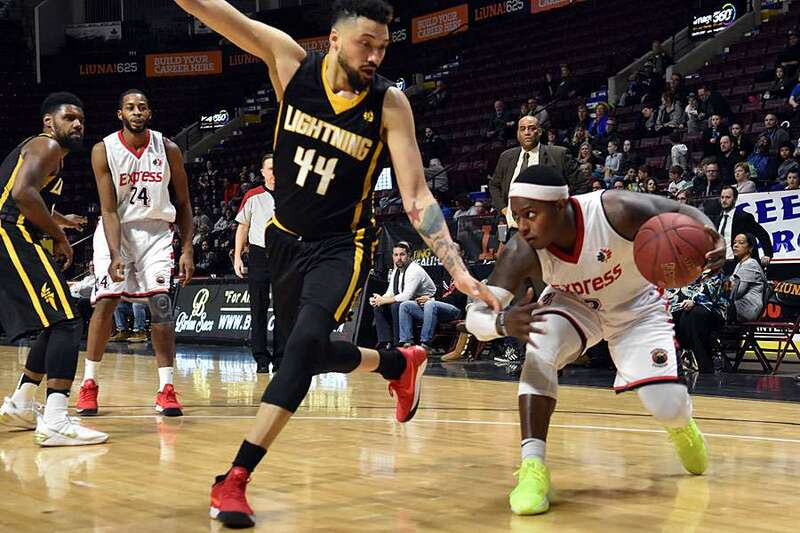 Despite the return of the always dangerous Ryan Anderson, Kirk Williams Jr, and Maurice Bolden, the Express defended their house and sent the Lightning back up Highway 401 with a 107-96 loss. The more than 2,000 fans in attendance were treated to Chad Frazier dropping a trey to open the scoring and then follow it up with a 2-point effort. When Shaquille Keith put up a long ball of his own, the noise in the arena rose higher. Coupled with barring the door defense, Windsor quickly separated themselves from the Lightning. With 1:30 to play in the 1st quarter, Braylon Rayson threw up a lob to the rim where Desmond Hurbert completed the scoring play with a two-handed reverse slam. Frazier then rejected London’s attempt to retaliate and was allowed to run unmolested to lay up 2 points on the return. At the buzzer, fans loudly appreciated the 23-14 Express lead over the Lightning. The 2nd quarter began with as much energy and movement as seen in the opening 12 minutes. London edged out Windsor over the first 3 minutes, 11-9. Later, when they were up by 11 points, Windsor got a wake up call when they failed to produce points on a 3-on-1 advantage, and threw the rock into the first row of the courtside seats. They quickly returned to the basics which had made them successful up to that point in the game. Great appreciation was shown to Logan Stutz for the extra effort he displayed in extending an Express attack. The Express moved the ball with great urgency while the Lightning was unable to react in a timely manner. Uncharacteristically, London was seen passing the ball to the crowd on at least a dozen occasions through the course of the game. By the end of the half, the evenly match teams retired to their respective dressing rooms with Windsor leading 54-44. On every close play or call against Windsor, the very vocal fans made their displeasure known to the officiating crew. London came out for the 3rd period intent on cutting the Windsor lead down to size. They managed to get to within 3 of the Express, before the home side gathered their composure and fought back. The audience was particularly upset, however, with some questionable officiating. One infraction in particular involved Stutz getting mugged from behind, but was issued with the foul. Windsor managed to reverse the tide and finished the quarter up 84-70, largely on the back of Keith draining short after shot from downtown. The final frame kicked off with a power outage at the arena. With the emergency lighting flicking on, the Express Dance Team entertained the fans while the problem was rectified. Once play got underway, Keith continued his bombardment from beyond the arc while the Express defense closed down the London shooters. The crowd was brought to their feet when Keith targeted a shot from almost mid court. Anthony Ottley Jr followed suit with 3 from the near court. At the 4:50 minute mark, the Express crossed the 100-point mark. In recognition of their desperate situation, London started to apply some time management to the clock with 4 minutes left to play. At 3:26, and in the wake of a Rayson layup, London head coach Keith Vassell called time out while facing a 21-point deficit. With the clock running down, the crowd punctuated every London mistake and oversold every Windsor play. The Lightning came out of the huddle and shifted gears to a full press, but Rayson head-manned the ball to Ottley who dished to Stutz for 2 in the paint. With 10 seconds left and counting, the crowd acknowledged the Windsor 107-96 win. For London (14-7) it was the second straight loss while the Express (9-11) have two on the plus side and inching closer to .500. It doesn’t get any easier as the two teams will tipoff against each other again this Thursday at Budweiser Gardens. Windsor’s next home game will be the following night when they host the Niagara River Lions at 7pm.